Based on the routine of the double broadswords, the Taiji Double Sword routine is created with the body position and techniques of the single sword of Chen-style Taiji Quan. There are 39 movements in this routine. The swords are played smoothly and continuously as water runing or cloud flying. When rushing round, two swords are like butterfly dancing and when crouching like a tiger ready to pounce. With body turns around like a python or a black bear, quickly and powerfully. The whole play shows Taiji Quan's double features of hardness and toughness with softness and looseness dwelling in. 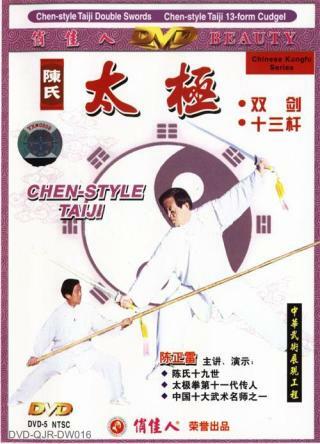 Chen-style Taiji 13-form Cudgel is also called 13-form Big Spear. It belongs to the middle-long weapons. The length of the stick is over 3 meters. The routine is short consisting of thirteen carefully selected movements. The movements are practical and powerful. They are stick, twine, sweep, block, ward off, parry, press, chop, and so on. The exerciser must have a good command of basic boxing skills. Exercise requirements: Keep your crotch round and steps steady and turn your waist quickly and twine your opponent's arms forcefully.